It was 3:35, with less than than half an hour before the usual 4:00 supper; and Gramercy Tavern sous chef Kyle Knall was making the starch for a Middle Eastern-themed family meal. Plain couscous wasn't good enough, so Kyle scanned the kitchen, considering his options. Across the aisle, another sous chef, Geoff Lazlo, was preparing four different kinds of carrots for a glazed carrot dish that calls for carrot juice — so that became part of Kyle's dish. He added star anise and cinnamon to the couscous, poured in carrot juice and stock, and let the couscous sit to absorb the liquid while he turned out a quick raw salad of onions, raisins, and herbs dressed with lemon juice and olive oil. The couscous went into the bowl with the salad and an otherwise plain grain was transformed. You can find carrot juice in the fresh-juice section of a gourmet market or health-food store. Combine the stock, carrot juice, star anise, cinnamon stick, and garlic in a medium saucepan and bring to a boil. Add the couscous, cover, and remove from the heat. Let sit until the liquid has been absorbed, about 10 minutes. 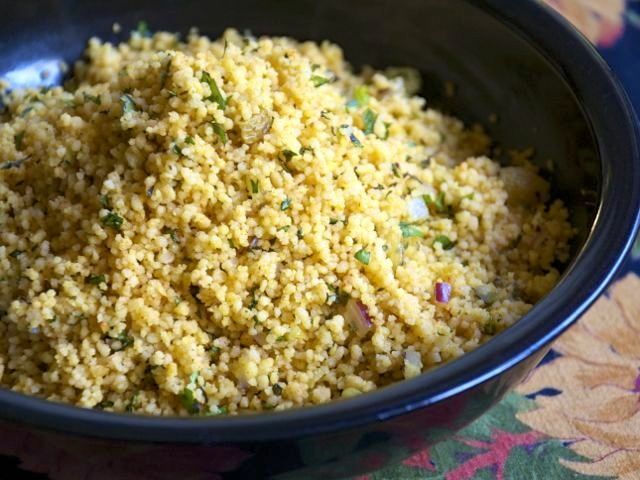 Combine the onion, raisins, herbs, lemon juice, olive oil, and salt and pepper to taste in a bowl large enough to hold the couscous.